The Scottish Working Forum on Official Publications celebrated it’s 25th Anniversary last year. 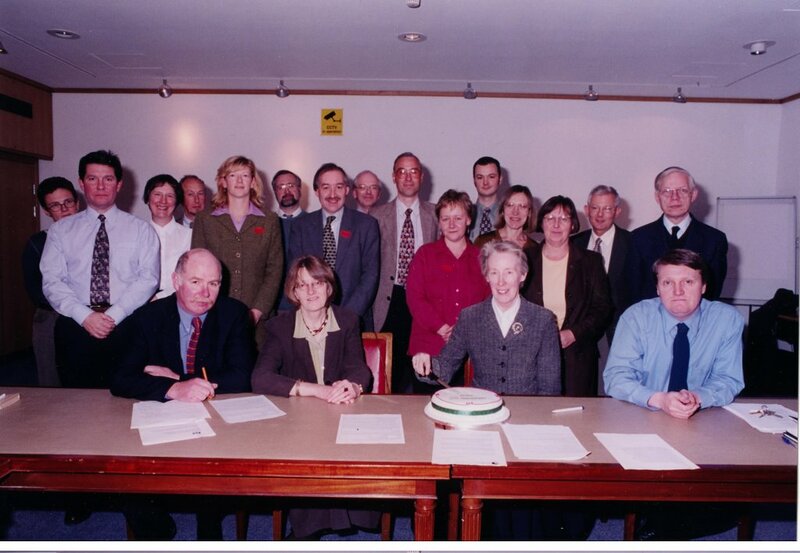 I would like to share an image of the SWOP group at its 10th Anniversary meeting in 1999. Standing from left to right: Kay Munro and John Moore (Glasgow UL), Sheila Aitkenhead (Strathclyde UL), Nick Brotchie (Scottish Law Commission), Gillian Stirton (HMSO), David Hart (Dundee UL), Alan Pawsey (HMSO), Gordon Willis (Stirling UL), Brian Bourner (Scottish Executive), Fiona Myles (Edinburgh Central Library), Jonathan Elliot (SPICe), Paulette Hill (Historic Scotland), Liz Mackie (Aberdeen UL), Peter Wellburn (NLS), Kenneth Fraser (St Andrews UL). Seated from left to right: Alex Tomeny (Mitchell Library), Margaret Dowling (Edinburgh UL) Ann Matheson (NLS) Eric Dickson (NLS). Many thanks to Dr Ann Matheson for supplying the photograph.